Buying or upgrading your garage door can reap many rewards for your house, from better curb appeal to increased resale value and enhanced security. With this in mind, it’s crucial to take your time when deciding on a new door purchase. Read on to find out which three questions you need to ask yourself before you start garage door shopping! Garage doors come in a wide range of types, designs and most importantly, price ranges. How much would a unit set you back? Well, it can vary from a few hundred bucks for a basic, wood-composite door to around 10 thousand dollars for a modern, more technologically advanced model. 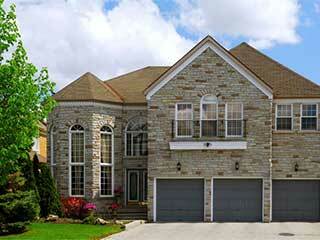 How much you can spare is probably the deciding factor when considering a new garage door. Furthermore, setting a budget allows you to figure out your options. If you can, it's a good idea to go for a higher end door - you will most likely get a return on investment in terms of life-time durability and you may add to your overall property market value. What Type of Door Meets Your Needs? Garage doors are commonly swinging, rolling or sliding. The architecture of your house may influence your choice of door. The rolling-type is probably the most storage efficient.. Another aspect to consider is the material the door is made of – typically, wood, steel, aluminum, and including fiberglass in many instances. Each material has its own pros and cons. Wood doors generally require more maintenance and periodic varnishing while steel doors can be prone to rust and may require corrosion resistance treatments. The weather conditions of the area you live in may also impact your choice of door and the level of insulation you think is necessary. Where To Buy Garage Doors? Whether you're looking to purchase a new garage door system or just the door, we can help you understand the choices available. You can buy your new door directly through us and we'll also install it for you. Contact our team at Garage Door Repair Libertyville for more advice on choosing a new door – our technicians would be happy to help!